prepare him/her for the emotional ups and downs that lie ahead while in mourning. 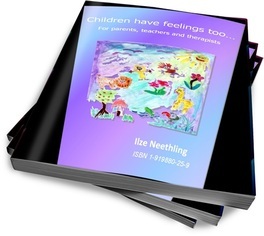 “Children have feelings too…” is an interactive work book for children from about 9 to 14 years. Success with younger children has also been established where activities and wording be customised to each child's particular developmental level and requirements. to work through his or her feelings in a creative way in order to obtain control over his or her emotional life. In other works, as with the other books, this book is also practical in nature. Aspects that are addressed include for example identifying different emotions (feeling cards are supplied and can be copied), how to express feelings properly, without negative consequences for yourself or others, stress management (breathing and other exercises that can be easily done), the relationship between our thoughts and our feelings, and how children can practice problem solving. Various "plans" are given and demonstrated step by step. Anger management is also addressed. 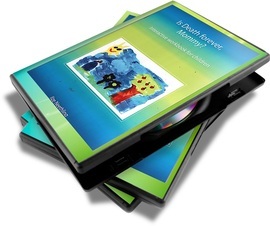 Teachers and therapists can utilse the book successfully when working with children, as the content is therapeutic in nature and activities can easily be integrated into intervention plans. It is also a needed resource for Parents who are willing to work through it patiently and lovingly with their children. 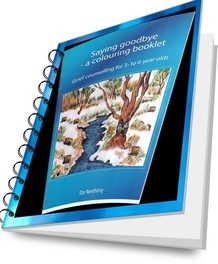 "Saying Goodbye - a Colouring booklet"
A colouring booklet for 3-6 year olds. adults. Increasingly, we struggle how to assist young children to cope with the loss of their loved ones. The booklet is presented very simple and informal in a medium that children in this age group should be familiar with (paper, colouring pictures, crayons and colouring pictures or paint). The images serve as a safe starting point to guide the child creatively through the grieving process. Efforts have been made to target and normalize the primary emotions, questions and fears children experience, in this stage of development per colouring sheet. The booklet is experiential in nature and aims to assist children to talk about death and to work through the seesaw of emotions (especially the feeling faces promote emotional intelligence if the child is led by an appropriate adult); to address key issues and thus to process and integrate the loss. Adults are especially encouraged to help the child through the sketches and colouring to express his/her feelings in words. Note that the book is educational in nature and may not necessarily include all aspects of grief - although it is attempted to address that gap through creativity. The activities can also successfully be used in group context. http://uir.unisa.ac.za/bitstream/handle/10500/1184/Dissertation.PDF?sequence=1. The Relevance of pastoral counselling in Sout Africa with referance to the South African Association for Pastoral work. http://www.unisa.ac.za/contents/publications/docs/psych282.pdf. Vlakke van Internetbetrokkenheid. Pg. 48.